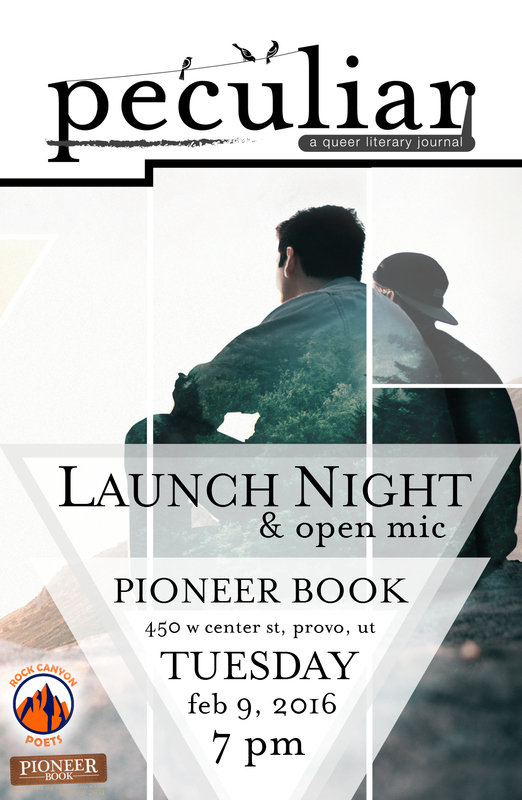 Rock Canyon Poets and Pioneer Book are pleased to host the second issue of a queer literary journal, peculiar, will have its official launch night at Pioneer Book on February 9th at 7:00 PM. Select contributors to the journal will read their poetry and prose, including this issue’s Featured Writer: Spencer Ballard. An open mic will follow and copies of the journal will be available to the public for purchase. Make sure to arrive early for a good seat! A new issue of peculiar will now be published every winter and summer, different from the initial plan of spring/fall. The first issue was completed in May 2015 with funding from a small Kickstarter campaign. Volume 2, Issue 1 is 107 pages long and features a collection of poetry, short stories, art, and photography from 26 queer Utah writers and artists. To purchase copies of peculiar or submit work for publication, visit http://www.peculiarjournal.com/ . For any other inquiries, contact peculiar at peculiarjournal@gmail.com or follow them on Facebook, Twitter, and Instagram.